Did you know that historically Britain has a long and proud tradition of relying on volunteers to help people help themselves and that today volunteers are touching other people's lives by solving problems while exploring new chances for personal growth. A Volunteer is a person who believes that people can make a difference and is willing to prove it. 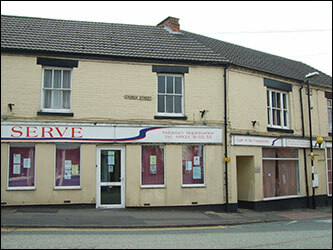 SERVE operates from two shops situated at 15 & 19 Church Street, Rushden. Here the elderly and the disabled can ask and obtain help. SERVE covers Rushden, Higham Ferrers, Stanwick, Irthlingborough and Raunds. You do not have to be on income support to receive assistance. What is available at SERVE A friendly face that will listen to any problems that you may have. Somebody who can help complete any form that you may have difficulty with, for example, DSS forms. SERVE have equipment available, wheelchairs, zimmer frames, and commodes which can be loaned out on a short term basis. We are also able to purchase equipment which can make daily life easier for the elderly and the disabled. We have available hearing aid batteries and tubing. Trained volunteers are able to deal with any hearing aid difficulties you might have. The SERVE transport pool was formed to assist people to travel to medical appointments e.g. doctors, dentist, optician, chiropodist or hospital. We can also help with shopping. A SERVE volunteer driver will collect the client from their home, take them to the appointment, wait and return them home for which a small charge will be made to cover petrol cost. SERVE are happy to accept the travel tokens issued by the East Northants District Council. Monday 11.00am - 12.00pm call in at the Day Centre, College Street - Hearing aid repairs also carried out. *If you live in these areas all our services are available to you. Safe Hands - all ages, all disabilities, are supported in their own homes by our trained carers to give respite care. Under this scheme various types of help can be offered to you, your relative or friend. All you need to do is make it known to us that you are in need of help. Rushden Carers' Support Group - Organised by District Nurses, Social Workers and SERVE at Crane Ward, the third Tuesday of every month. Feel free to come along and meet with us for any help you may require. Helping Hands - are cleaners paid for by clients who will do just what you, the client, would like them to do. There's no stopping Gran since we hired that wheelchair from SERVE. ELDERLY residents in Rushden have had a £1,000 hi-tech boost. 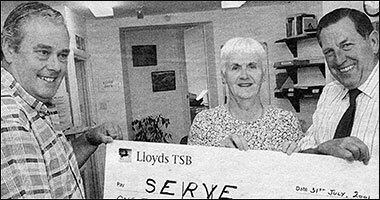 The town's branch of Age Concern presented the money to charity for the elderly Serve, based in Church Street, to go towards converting part of the centre and buying computers. Serve operations director Barry Graves said: "It's excellent news for us. The idea is to have a purpose-built venue open to our clients, the over 60s, but also to the community as a whole. We hope it will be open by the end of the month.